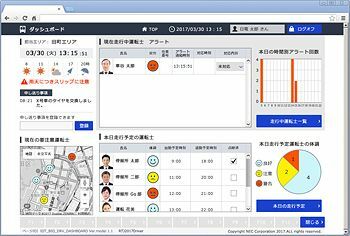 Tokyo, July 03, 2017 - NEC Corporation (NEC; TSE: 6701) today announced a pilot program in cooperation with Odakyu City Bus Co.,Ltd. for testing a wearable device that collects the biological information of drivers as part of improving the safety of bus operations. The safe and reliable operation of public transportation, such as buses and trains, is heavily dependent on the health of its drivers. NEC is helping to ensure the smooth operation of this critical infrastructure with the development of a wearable device that monitors the biological information of transportation staff. In this pilot, an easy to wear, non-obstructive wristband device measures and collects a driver's biological information, including pulse, temperature, humidity, and body movement, while driving. This data is then sent through a smartphone for analysis by the "NEC the WISE IoT Platform," a suite of functions for Internet of Things (IoT) systems based on NEC's cutting-edge artificial intelligence (AI) technologies. Resulting from this analysis, NEC aims to develop a safe transportation platform that will help to visualize, monitor and assess a wide range of health factors, such as a driver's degree of fatigue and changes in physical conditions, which a driver may not be able to recognize on their own. "NEC is aiming to contribute to workplace reforms that enable operators of buses and trains to perform at their best while enjoying better health conditions," said Akihisa Sudou, Manager, Transportation and Logistics Solution Division, NEC Corporation. "As our cooperation with business partners expands, the ongoing improvement of work schedules and operating conditions should deliver improvements in the quality and safety of services."